It’s my last Friday in Tanzania. Storytime. I’m about to describe my worst ride in a three-wheeler or bajaj. Like in a good suspense movie it’s more about what didn’t happen. 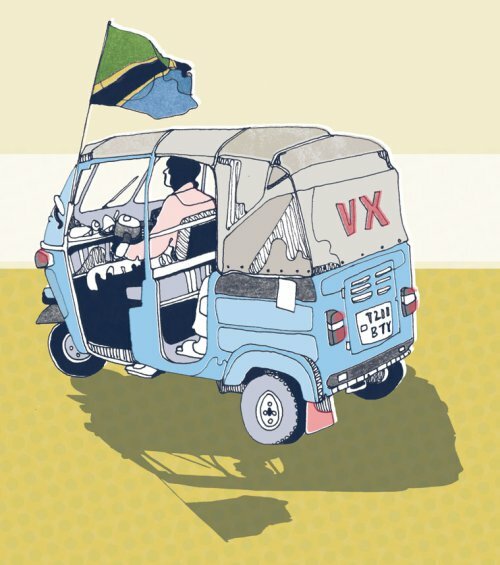 There was an air of danger throughout the entire length of my trip to the Julius Nyerere airport in Dar es Salaam. Anything could have happened. What is a Slum in Tanzania? With time my perception changes. I can almost feel it. It’s due to the fact I am confused. What is poor and what is rich? At their extremes these terms are clear. But what’s going on in the middle? Whenever I see a dirt poor person with threadbare clothing and no shoes walking the streets the sign “poverty” flashes up in my head. But occasional local companions label such persons as “crazy”. So it starts to look like only the mentally ill are at the very bottom of the pyramid. Tanzanians have a great hand with barbeques, as do the Kenyans and the South Africans and the Swazi and probably a great many more people in Africa and in the rest of the world. Ah, not to forget the Argentinians! Bus trip Dar es Salaam to Dodoma takes 8.5 hours and more if there are traffic jams. The road is heavily used by trucks transporting goods to neighboring countries such as Zambia, Malawi, Congo, Burundi and Rwanda. It is a trip best enjoyed in one of Shabiby’s Luxury VIP buses and during daytime as there are so many things to be seen. Saturday July 18 marked the end of Ramadan. But on Thursday evening July 16 nobody in my office or in the rest of the country knew if they would go to work on Friday or if it would be a public holiday. All depended on the sighting of the new moon at nightfall.